Deb Williams (Paige), Victor Dolhai (Isaac), and Andrew Wheeler (Arnold) in the Pi Theatre production of Hir. Photo by Tim Matheson. The family dramas playing out across the United States this weekend must be off the charts. As millions of American families gather south of the border to celebrate American Thanksgiving though, you would be hard pressed to find a reunion quite like the one playing out on stage in the Pi Theatre production of Hir. Returning to the family home, eldest son Isaac finds a lot has changed in the years he has been away. His mother has let the house rundown. His father has had a stroke. His younger sister has made some big changes. 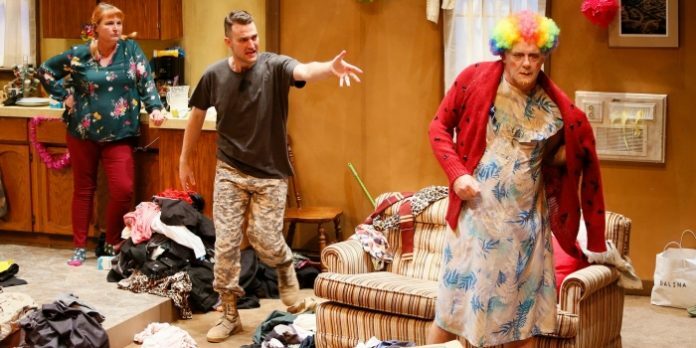 While on paper it may all sound a bit dull, in the world created by playwright Taylor Mac there is nothing boring about this family dynamic. Mom has overthrown the patriarchy following years of abuse. Dad is forced to wear a nightgown and diaper. Sis is well on her transition to male as she transforms into Max. Not wanting to give away too much, recognize this as just the simplest of Coles Notes. For what really makes Mac’s play so compelling are the layers he has created in his exploration of the middle class. Ironically, having called the middle class boring back in 2013, Mac has gone out of his way to ensure this family in transition is anything but, for just below the surface lies a microcosm of a society struggling to come to terms with some pretty meaty topics. PTSD, gender and queer politics, domestic abuse, and identity are but a few of the multiple layers on which Mac plays, turning the ubiquitous kitchen sink drama on its head. Hir is also surprisingly funny. 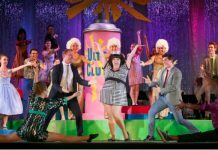 Under the direction of Richard Wolfe and some terrific performances though, the underlying ridiculousness of what is transpiring on stage is tempered by a startling reality. Andrew Wheeler (Arnold), Victor Dolhai (Isaac), and Jordan Fowlie (Max) in the Pi Theatre production of Hir. Photo by Tim Matheson. Leading the way is a bravura performance from Deb Williams. Having perfected the maternal role as one of the forces behind the Mom’s The Word Collective in recent years, Williams skillfully inhabits the power of this matriarch for a new millennium with a manic passion. With her ample comedic abilities on display, she easily turns the outrageous into the authentic. As fearless as Williams, and with far fewer lines, Andrew Wheeler manages to bring the disabled and ousted head of the household to life inside a largely lifeless body. As he is subjected to every manner of degradation, including a number of scenes where he is treated better than most family’s dogs, Wheeler manages a whiff of the broken man looming large over this broken family. He is the cause of much of what has brought the family to this point and his is a deliciously absurd and deserved reward. 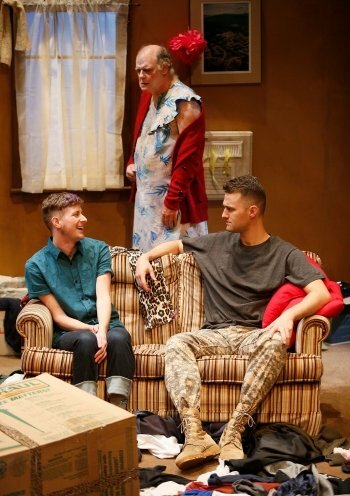 In Hir’s early going, the two offspring played by Victor Dolhai (Isaac) and Jordan Fowlie (Max) may have some difficulty in finding the realism within their characters, but they gradually loosen up to match the performances of the two veterans on stage. With shades of their father giving credence to the apple tree proverb, the two younger players embrace their new place, while keeping one foot lightly planted in the past. Helping its characters to inhabit Mac’s derelict world, set designer Patrick Rizzotti has provided a realistic family home including the necessary kitchen sink, the constant running air conditioner, and strategically placed pictures on the walls designed to hide part of this family’s dark past. Sound designer Mishelle Cuttler helps immensely with sound effects, and costumer designer Carmen Alatorre melds the bizarre with reality. Thanksgiving for us north of the border may be a distant memory, but with the Christmas season looming, the sense for familial foreboding for many has already begun. While our own family gatherings may never reach the fever pitch like those in Hir, it is a mirror we cannot ignore completely. Let it be a cautionary tale. Hir by Taylor Mac. Directed by Richard Wolfe. A Pi Theatre production. On stage at The Annex (823 Seymour St, Vancouver) until December 8. Visit pitheatre.com for tickets and information.